You are here: Home » Potato Starch Defended! Now, a new contender is here for the superfood crown: resistant starch, especially in the form of raw potato starch. If you haven’t encountered enthusiastic advice to add potato starch (just stirred into a glass of cool water, yum?!) to your diet in order to treat all manner of ills, you probably will soon! Sarah Ballantyne, PhD, suggests that people have boosted RPS to superfood status, and recommend eating it to the exclusion of all other foods! Unfortunately, the way potato starch supplementation is currently touted, as a gut microbiome-enhancing substitute for eating a variety of vegetables and fruit, doesn’t look like a strategy that lives up to the hype. And even has a nice little cartoon to drive the point home! 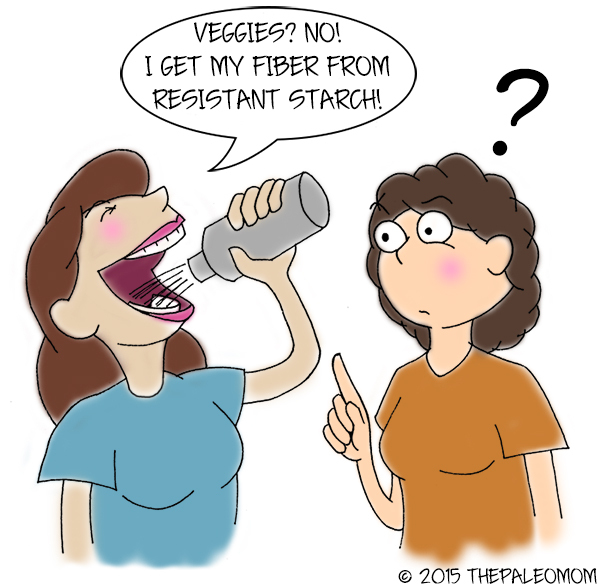 There’s little doubt that resistant starches play a beneficial role in our diet, and can go a long way in supporting healthy intestinal flora… Unfortunately, the way potato starch supplementation is currently touted, as a gut microbiome-enhancing substitute for eating a variety of vegetables and fruit, doesn’t look like a strategy that lives up to the hype. The best solution? Eat resistant starch where it naturally occurs! Cooked potatoes (which contain RS2 and RS3, of course, there’s even more RS2 in cooked and cooled potatoes), raw green bananas, plantains, yams, and other root vegetables provide not only resistant starch, but also a variety of other fibers and micronutrients that benefit health. Raw potato starch may be convenient, but in the long run, it’s less likely to benefit your health than eating resistant-starch-rich whole foods. Can anyone else spot the mistakes in her concluding paragraph? Please, go have a look and read my comments, I was happily surprised they were allowed past moderation, which shows me that Dr. Ballantyne is open to learning from us. Leave one of your own, if you like, but realize that Dr. Ballantyne is trying to be helpful. Maybe she’s seen blogs that advocate RPS to the exclusion of real foods. I have certainly never recommended that, and hope that no one here does it. …it should serve as a warning that supplementing with isolated resistant starch may carry unforeseen risks—especially if it’s not carefully balanced by other soluble and insoluble fibers. … and using the same carcinogen protocol that the soluble, highly fermented NSPs (guar gum and oat bran) also enhance tumor formation relative to both low fiber–and wheat bran–containing diets.2 Thus, the effect on tumor formation of potato-derived RS is qualitatively similar to that of soluble rather than insoluble NSP. Oh, and if you want to prevent colon cancer in the first place, here’s a thought: Supplement with raw potato starch! The Paleo Mom is a great blog, her Fiber Manifesto is very good, and also lots of good articles. I’ll add her to the side blog-roll so we can keep track of her RS evolution. Maybe one day she will see that raw potato starch fits very nicely into her ideas on fiber, and makes a great prebiotic supplement for those that can tolerate fiber. This might even make a great chapter in her next book, to fill in some holes in The Paleo Approach: Reverse Autoimmune Disease and Heal Your Body. Raw potato starch is not a substitute for eating a healthy diet, and raw potato starch may not be tolerated by everyone, especially those with dysbiotic guts and even some auto-immune conditions. But to make generalized claims that everyone should be leery of taking raw potato starch as a prebiotic supplement is just plain wrong, and extremely short-sighted.